WHEN rose enthusiast Len Johnstone moved into the new building at St Vincent’s Care Services Bardon in February last year, he wasted no time putting his talents to good use. 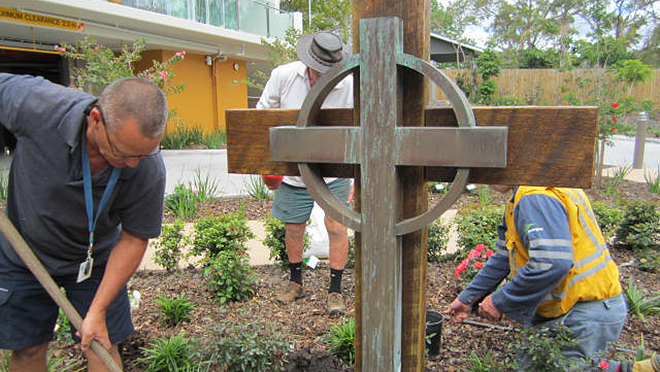 Years earlier, Len had personally developed the much-admired rose garden that stood on the roundabout at the entrance to St Paul’s Villa located within the St Vincent’s Care Services Bardon facility. As part of the redevelopment of the facility, this roundabout and the roses had to be removed. Len decided to donate his time and skills once again to create a new rose garden. A member of the Queensland Rose Society, Len had received many awards for the varieties he had grown over the years. He was responsible for developing rose gardens throughout Brisbane, with notable examples being the Ashgrove Bowls Club and the Marist College Ashgrove display that boasts more than 300 roses. At St Paul’s Villa, he set about mobilising a team of volunteers and spent months planning and selecting the perfect rose varieties to include in the new garden. His wish was for residents and visitors to be greeted with a wonderful display of colour every time they entered the village. This time around, Len’s health restricted him from actually planting the garden, but with the unfailing support of his wife Bridget and his friends, he co-ordinated the volunteers to create a stunning display of roses. Taking pride of place in the new garden are two special varieties: “Bridget’s Joy”, named after his wife, and “Lenny”, the rose named to commemorate Len’s 90th birthday. Sadly, Len died late last year, but his beautiful legacy has left a unique mark on St Vincent’s Care Services Bardon. Like the many other gardens he created, this one brings colour and smiles to so many people. For more information on St Vincent’s Care Services call 1800 778 767 or email svcs.info@svha.org.au.